It is not often that I judge travel options well. But I think this year I got something right. 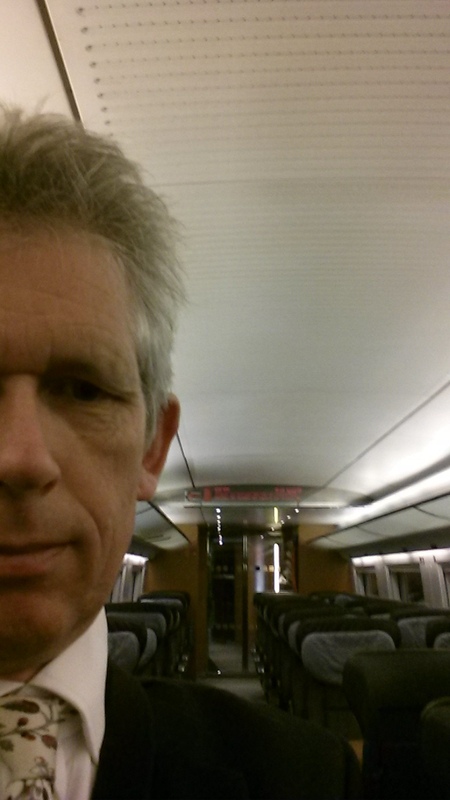 I write this sat on ICE611 heading to Munich (picture left) having escaped on the 0858 Eurostar London to Brussels this morning and then joining a slightly delayed Thalys from Brussels to Köln. I took the decision on Sunday evening to abandon my plan to travel to London on the 0620 Victoria bound train this morning and book myself into a Travelodge hotel close to St. Pancras station in London. On waking up this morning I discovered that all trains into London from the South Coast are subject to cancellation arising from a landslip near East Croydon, amongst other obstructions caused by a major storm that crossed the UK during Monday and into Tuesday with considerable force. I’d like to thank those people who helped me get away yesterday evening. As a regular flyer to Munich, I can sympathise with those people stuck at Gatwick Airport suffering from severe delays and cancellations due to a weather-related power failure. This is the second year that I have taken the train to Munich for my Christmas visit having suffered previously from delays and cancellations caused mainly by fog. And airlines.